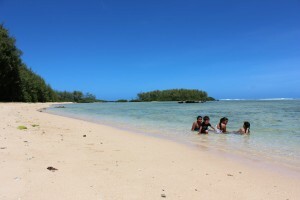 Inarajan is the untouched paradise of Guam. Going into the village you will be automatically be greeted by its history and culture. Many remnants of the ancient Chamorro’s and Spanish explorers still remain. Its air and coastal waters are crisp with freshness. And the abundance of the lush greenery, will put your mind at ease. Inarajan is not too far away. It is a little less than half an hour’s drive away from both the Naval Base in Santa Rita, and the U.S. Naval Hospital in Agana. The driving time is also the same when traveling to Guam’s downtown area, Tamuning. The drive to the village is a nice scenic route with mountains, valleys and ocean view from every corner. And traffic is rare in this side of the Guam. There is a middle school in the village, and for those whose children will be going elsewhere, there are bus stops around the village. If you are one to relax and enjoy the island breeze, then look no further than Inarajan. Located by the waters, the ocean breeze in the wind is tranquil. There are many natural swimming holes in the village, which is popular among the locals. The land is lush with trees that bare mangoes, macadamia nuts, star apples, coconuts and more. Many fishermen or outdoor enthusiasts flock to its waters for a good catch. The view of the mountains is an eye catcher as you make your way through the hills. One of the main scenic attraction of the village is the Inarajan Pool, a local and visitor favorite. It is a natural saltwater pool that is connected to the Pacific Ocean, but sheltered from waves and current. The village has a U.S postal service, a gas station, a health clinic, and ATMs all for your convenience. Inarajan reminds you every day that you live in paradise. With the breeze that runs through the palm leaves, and the ocean mist that tingles your nose, it is genuinely a placid environment you and the whole family to embrace. Paradise is just outside your doorstep! We guarantee you Inarajan do not let down those who seek the island life. Its sunrises are sure to please the morning goers. Its waters are crystal clear, and the waves crashing against the reef is simply beautiful. The atmosphere in the village is surely slow and laid back, which is great. We hope you find the village as relaxing as we do!